Racism and access to capital are barriers to development in Milwaukee’s central city, but three developers who have overcome these obstacles are challenging the mindset that philanthropy and profit can’t go hand in hand. The belief that the private sector will take care of itself and that nonprofits will handle the less fortunate communities is a fundamental myth that needs to be changed, they argue. 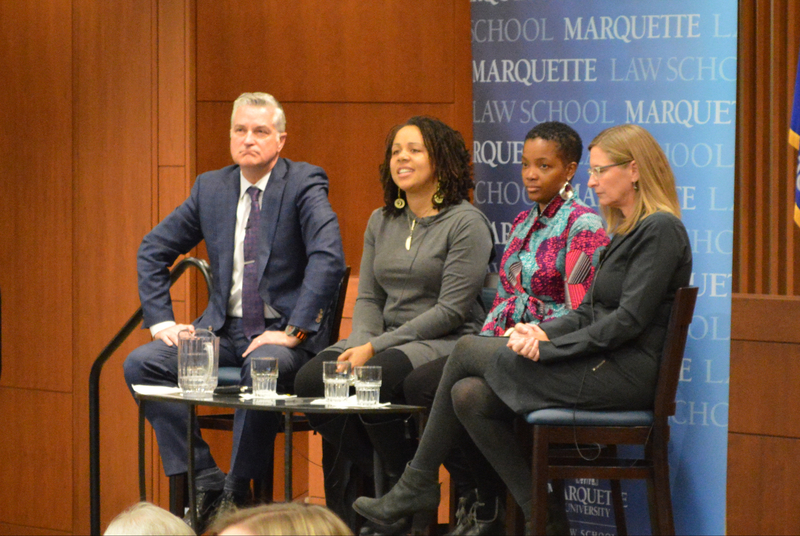 Juli Kaufmann, JoAnne Sabir and Melissa Goins spoke recently at Marquette University’s “On the Issues: Revitalizing Milwaukee Neighborhoods,” moderated by Mike Gousha. The women, real estate developers and entrepreneurs, said that finding innovative ways to convince people to think differently about community development has been a major part of their experience. “Traditional real estate systems and traditional financial systems do not work in communities of color and disinvested neighborhoods,” said Kaufmann, president of Fix Development. Goins, president of Maures Development, has invested about $75 million in Milwaukee during the last 12 years through grants, investor equity and traditional debt. She admitted that community-minded developers sometimes don’t profit as much as they could. “There are times when the community good really is our priority,” she said. Goins’ most recent project at 7717 W. Good Hope Road, will replace the outdated Mill Road Library at 6431 N. 76th St. Her firm successfully raised the funding to develop an 18,000-square-foot, technologically modern library building, which they broke ground on last month. The building will also have 65 mixed-income apartments. The goal of such developments is to create opportunities that will spark further community investment and access to services. Sabir said that entrepreneurs need to think about the community’s needs while also staying grounded in the numbers. The Juice Kitchen, which she co-owns with her husband in Lindsay Heights, has been open for nearly three years at 1617 W. North Ave., and will net $500,000 this year, she said. The Juice Kitchen provides healthy fruit, juice and meals to about 500 diverse people a day, according to Sabir. “We were called to be in a neighborhood where folks didn’t think we would thrive; where people didn’t imagine that there was a desire for a healthy offering,” Sabir said. The business is housed in the Innovations and Wellness Commons, a Walnut Way project that Kaufmann co-developed. A community-driven initiative, the Commons provides sustainable jobs, increased local access to services and space for several other small businesses. 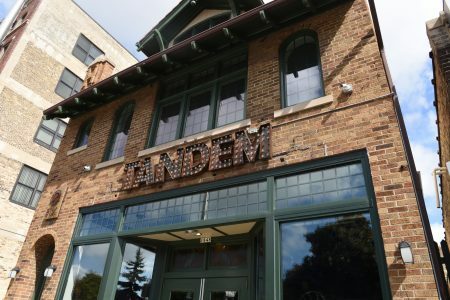 The Tandem restaurant, another Kaufmann co-development, is just a few blocks away at 1848 W. Fond du Lac Ave.
Kaufmann said Tandem represents “the story of how a community rises up together through a piece of real estate.” A foreclosed commercial property, the building is now home to eight small businesses, primarily owned by women and people of color, who employ mostly local hires. The building has nearly 50 co-owners, a third of whom live in the neighborhood. The success of these developments rests not on “transactional” processes, the panelists said, but on relationships. When thinking about employment, they consider the whole individual, encouraging wellness and fostering life skills beyond technical job training. Her latest project with Sabir, the Sherman Phoenix, is another redevelopment that they hope will promote community-driven values. Located in the former BMO Harris Bank building, at 3536 W. Fond du Lac Ave., which burned in 2016 during the unrest in Sherman Park, it is set to open Nov. 30 and will be home to 29 small businesses with 55 community owners. The women insist that strong partnerships are the best way to achieve their goals. Sabir said she finds strength in her relationships with Goins and Kaufmann not only as dear friends, but as mentors. “When we talk about this mentorship and what’s next, I think that always curating the abilities of others and then allowing for that support system is critically important,” Sabir said, adding that she also draws strength from the community. Several of the audience members asked how they could help invest in and develop neglected neighborhoods in Milwaukee. The panelists said that many of their investors, such as the nearly 50 owners who contributed to Kaufmann’s Tandem project, invested the minimum $1,000. Although some larger investments came from “angel” investors who have more money, the majority were smaller amounts from community members. For people without capital to offer, they said the best way to get involved is to volunteer for a project or simply become patrons of the businesses in these communities. Goins said that their work and the lessons they’ve learned can be an example for positive change. “It’s hard out here in these streets,” she said. “But if you’re committed to it and you’re willing to put in that effort” you will achieve your goal. Thanks for this article. Many good thoughts in the article. Many good wishes for continue success in this area and all of Milwaukee.